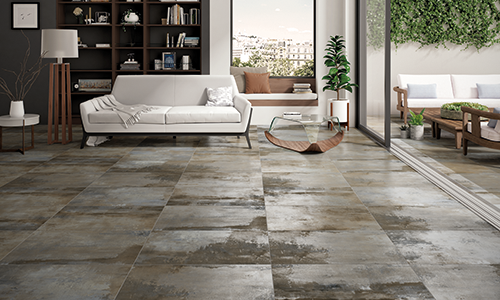 The variety of materials used to manufacture tile — clay, stone, terrazzo, quartz and metal — give each type its own defining characteristics. The most commonly used types of tile flooring are ceramic and natural stone. Ceramic tile is made from clay materials that are quarried, prepared and formed into moulds. Forming methods include dry press, extruded and slush mould. Ceramic tiles are best characterized as either porcelain or non-porcelain. Traditional ceramic tile is non-porcelain and made from clay and minerals, but contains 50% of a white dust or sand called feldspar, which bonds all of the moulded ingredients together during the kiln-drying process, resulting in variety and in the appearance and characteristics of ceramic tiles. Natural stone tile is produced from natural materials that are quarried, slabbed, finished, and cut to size. Common types of stone used as flooring tile include granite, marble, limestone (including travertine), and slate. Where and when the stone was quarried alters the characteristics of the final tile. Aesthetics aside, the durability of tile has long made it a popular option for flooring. A well cared for tile floor can last a lifetime. How long? According to a 2007 National Association of Home Builders study on the Life Expectancy of Home Components, the average life expectancy of a ceramic tile floor is 75 to 100 years while natural stone such as marble and granite can last more than 100 years. > Sweep or vacuum floor areas prior to cleaning to remove any dust or debris. > Test scouring powders and sealants on a small area prior to full application. > Use a sealer on grout joints shortly after installation and use products compatible with cleaning grout joints. > Rinse entire area with clear water after cleaning to remove any cleaning solution residue. > Only have damaged or broken tile removed and replaced by a qualified tile contractor. > Do not use cleaners containing acid or bleach for routine maintenance. > Do not use wax based cleaners, oil-based detergents or sealants to maintain your tile (sealants may be used on grout joints). > Do not harsh cleaning aids like steel wool pads or any scouring pads containing metal.